A few weeks ago as I was about to get on an airplane from O’Hare airport to San Francisco, I realized I had no reading material. I promptly scurried to the nearest airport bookstore and found myself frantically searching the shelves for the right read. It had to be mentally stimulating, innovative, exploring a cutting edge idea and relevant to technology and teaching. As I panned the book covers trying to make my selection like a magician waving a wand over hat waiting for a magic bunny to pop out, I identified with a short story from Dan Pink’s Whole New Mind. He wrote of the need for business leaders to embrace creativity due to the society of abundance in which we live in America. He described wine connoisseurs standing in wine warehouse with hundreds of Merlots competing with each other on the shelves. Which one? Well, the one with the catchy cool label, of course! Using a similar methodology, I found my book. The chartreuse cover got me, ahhhhh...that color that took me back to my passion for fluorescent clothes in the 1980s...come on, you remember the Cyndi Lauper, Duran Duran, and Boy George days. “Was this an attempt to reach out to the Gen-X market?,” I wondered … and the oh, so cool font that actually conveyed a message. The cover had me. 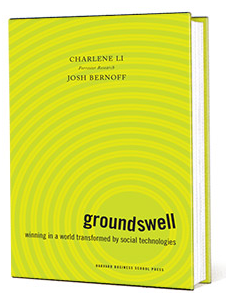 The book I chose is called “Groundswell” by Charlene Li and Josh Bernoff of Forrester Research, an IT and Marketing consulting group that partners with business leaders to harness the power of the swirling patterns and tornado-like trend of social technologies, among other projects. Social technologies? Yes, this refers to MySpace and Facebook but, as Li and Bernoff explain, social technologies reach far beyond the giant social networking sites that young people find more appealing than television these days. Social technologies also include discussion forums and user reviews, like those great hotel reviews written by people just like you and I that tell us what those hotel rooms really look and smell like, as well as content creation sites like YouTube, Flickr and blogs. The book is a fascinating read and the authors are clear about one message to business leaders, “If you want success, you can’t ignore the groundswell.” And like all fascinating and innovative ideas I come across, I can’t help but apply them to higher education. Social technologies, as Groundswell persuasively argues, have already transformed the way people in the US, Europe and parts of Asia are communicating but they’ve also reshaped the traditional business model. As the book explains, a company’s brand isn’t owned by a corporation, it is molded by its customers. Customers are sharing thoughts about your brand right now in the groundswell, whether you want to acknowledge this or not. You have to listen to the groundswell to identify your brand. What you learn may be in sync with your vision of your brand but you may discover that your customers don’t quite agree. Listening could be viewed as a risk, as you’re opening yourself up to the possibility of hearing some very negative reflections of your brand but, in this age of interconnectedness where information travels at the speed of light, not listening is much riskier to a business leader. Li and Bernoff explain that businesses regularly spend tens to hundreds of thousands of dollars working with research marketing firms to conduct focus group studies and surveys that can take up to a year to develop and retrieve information about their customers thoughts and feelings about the company. However, social technologies as a research medium can reveal far more relevant information in a few weeks. The interesting point is regardless of whether or not a business listens to the groundswell, the current of messages and ideas will continue to swirl. Ok, so how does this apply to higher ed? I see a tremendous amount of potential in the social technologies for recrafting pedagogy and enrollment trends in higher ed; however, I don’t see the same excitement and passion about listening to it as I detect in the private sector. Actually, I see many professors reacting to the "groundswell" as if it’s a pesky fly that keeps landing on their nose. They will do anything to just wave it away and hope it doesn’t really get in the way with their task. But can’t the groundswell tell us how we’re doing as educators? Can’t the groundswell assist us with understanding how we can meet the learning needs of our students? And how we can improve our student services? The groundswell holds tremendous potential for higher education to improve what we do but it’s also risky. The groundswell completely undercuts the traditions of higher ed which situate the “professor” as the owner of information, at the center of the class, surrounded by students who absorb the information and are rewarded with a good grade for reciting it back. The groundswell subverts this model. The groundswell places the professor in the role of a facilitator who must be ready to adjust the flow of a learning unit or the mood of a dialogue. The groundswell requires listening, acknowledging the validity of students’ thoughts and feelings and it requires flexibility and risk-taking. I think it was about three years ago when the groundswell first entered my teaching experiences. Now, we need to keep the notion of “tradition” in mind as we contemplate this example. I had a colleague of mine ask me, “Have you seen that new site called RateMyProfessor.com?” I looked at her eagerly and said timidly, “No.” She chuckled and said no more. I drove home frantically that night anxious to Google this new student generated rating system for professors. Part of me felt completely violated...what nerve these students have to “rate” me without my consent. The rest of me was so excited to ponder the effects of this new concept. I mean, when before have students had the power to highlight the positive and negative aspects of a professor’s class and share this information openly with the world? I began to envision the effects on enrollment patterns and a completely different notion of “accountability” outside of tenure. No, I’m not implying that tenure should, in any way, be affected by RateMyProfessor.com but what I do see happening is generation Y students “flocking” to the professors that have good ratings...yep, and that includes chili peppers (something I read as tied to our media driven culture in which “good” teachers are now expected to look “hot”….ugh). Wow, this is going to seriously rock some foundations. RateMyProfessors.com is part of the groundswell. Higher ed students pay for their learning experiences and want instructors who have favorable student comments. I think what they really want is to have professors who they like. Is this really so awful? Of course, we need to take these so called "ratings" with a grain of salt. Like all opinions, they're just "opinions." Freshman Irene Medina felt betrayed after relying upon RMP's info when she made her class selections. In a blog post, she recently wrote, "For one, students have different perspectives of a professor. We can’t all possibly have the same opinions about a teacher. That anonymous student loved his class but I completely hated it. Are the ones who love it the only students who know about that Web site?" Medina continues to ponder about whether or not professors actually post their own "ratings" in an effort to inflate their popularity. Hmmmm. Regardless, professors should be reading and listening to the comments in RateMyProfessors. Yes, take them with a grain of salt. Assume some of those students who you rubbed the wrong way with a tough grade are using the site to retaliate. Heck sometimes I wonder if some of the comments are posted by cronies or the professors themselves. We'll never know. But we still need to be aware of the messages that are out there about our classes. If you're a professor and you find something inaccurate or disturbing, talk to your students about it. Let them know you read the site. Listening, I mean consistently listening and responding to what one hears, is one step towards a major shift in higher ed pedagogy. It’s an indication of a shift from the tradition of a “sage on the stage” to a “guide on the side.” And to many professors, it’s scary. What if our students had the opportunity to engage in their learning experiences just as they can now engage in rating their professors? How would that transform learning? Some students may be more likely to share a problem with the class that would have otherwise gone undetected by the group. For example, if Jim’s professor wasn’t replying to his emails, he could share this information with the class and give other students an opportunity to chime in on the topic. A professor I spoke with recently shared with me that he was nervous to adopt blogs in his class because he was concerned about whether or not the students would have anything positive to say about the class. Well, if we don’t take a risk and listen then we’ll never know. So, what if, instead of posting lectures in Blackboard for our online students and then having them respond to prompts in a discussion board, we used Blackboard as a springboard or a huddle where our students get the plan for the the current learning unit, review critical content items and then jump into a Ning group where they create their own social profile, make friends with other students in the class, exchange ideas or debate class related topics, share bookmarks to relevant websites, retrieve thought provoking movies from YouTube and, together, create a community in which learning is social rather than linear. Weller’s thoughts are compelling especially to a major LMS like Blackboard whose tools are not only clumsy but archaic and non-visual. And I must concur that higher education does face a significant challenge but it’s one that few professors or administrators have acknowledged as more than just a mere “fad.” Or, worse yet, I often hear professors react with frustration and annoyance at the thought of having to change the way we teach just because they are socializing differently. We have to get through this “us” and “them” thing. We are in this together. But beyond the learning potential for social technologies and the groundswell of change they will evoke in higher ed, I’m also eager to consider the power of reaching out to our students through social technologies to understand their needs at an institutional level. What are the criteria for a high quality online college learning experience, from the students’ perspective? For years faculty have been trying new things in online classes and surveying our students to identify how successful the teaching experiments have been. Sloan-C is the best resources I’ve found for reviewing these terrific case studies..and they are consistently terrific…but couldn’t we or shouldn’t we, as higher ed professionals, begin to adapt Li and Bernoff’s business model for research to assist us with planning for the future success of our institutions and, ultimately, our nation? One in five higher ed students were enrolled at least one online class in 2007 and this number is growing. What would we learn about building quality online programs if we engaged our students in a dialogue about this topic and listened to what they have to say? Your comment about students liking teachers is important. I agree -- why not? When I worked in TV news, we were taught that the anchor was being invited into the home of the viewer every time the viewer watched the newscast. That's why the anchor must be likable, trustworthy, and, well, someone you would want in your home. Teachers on TV need to have that same kind of presence -- those who do have successful classes and high retention rates. I wonder if there is a similar issue with online relationships. Is an online class more successful where the teacher has created an environment of connectedness and friendship between all participants? I find it difficult to call strangers because I don't know the person and I can't watch the facial expression as I try to communicate. I have noticed a similar issue in online classes. My comfort level is significantly improved when the teacher provides a few tips and techniques for icebreaking in the online environment. Moreover, in an online class, is it important for me to like the teacher enough to invite her/him into my home? What are the consequences of disregarding this aspect?